Life for many of our ancestors in Ireland a century ago was less settled and predictable than our lives. It was a time of crisis and change in society. Several important events in Irish political and social history contributed to this. There was the Unionist backlash against the Home Rule Bill in the form of the Ulster Covenant, the 1916 Uprising, the Civil War, the War of Independence and Partition. The First World War was also raging. The Titanic had recently sunk and the Great Flu Epidemic of 1918/19 was around the corner. On a positive note, universal male suffrage and limited women’s suffrage was achieved in 1918. For the next decade significant events from last century will be marked on the island of Ireland. These celebrations are collectively known as the Decade of Commemorations. As part of this Fermanagh Authors’ Association has compiled an anthology of articles, poems and stories that link Fermanagh to the events of last century. I had the pleasure of co-editing the book with Seamas Mac Annaidh. 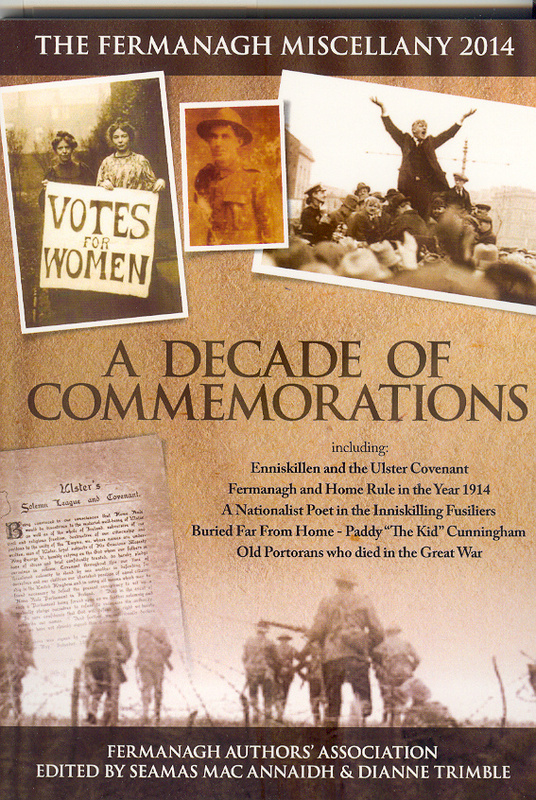 Fermanagh Miscellany 2014: A Decade of Commemorations was launched last week at Enniskillen Museum. It is funded by a Peace III grant and is available free from various outlets in County Fermanagh. This entry was posted in December 2013 and tagged 1916 Rebellion, Decade of Commemorations, Enniskillen Museum, Fermanagh Miscellany 2014, Irish Civil War, Irish history, Seamas Mac Annaidh, women's suffrage, World War I. Bookmark the permalink.